Like Trains? 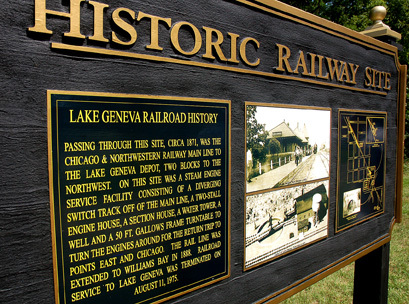 One current project of the HPC is to identify and research the old Chicago & NorthWestern railroad facilities that serviced Lake Geneva for many years. The buildings are gone, but their locations are known. The concrete railroad bridge across the White River is still standing. The old turntable and roundhouse were on the walking path beyond the bridge. That fine new sign shown above is near the site of the old turntable on Sage Street about a block north of City Hall. It explains a lot. Go see it! Pictured: on the left Ken Etten, chairman of LG-HPC & Ellyn Kehoe, Council Rep to LG-HPC; on the right Joe Piersen, C&NW archivest; P. L. Behrens, author of "Steam Trains to Geneva Lake" & Ed Yaeger, LG-HPC. The Wisconsin State Historical Society is planning to hold a Cemetery Restoration workshop in Lake Geneva Friday, May 18. Part of the program will be held in Horticultural Hall with some field work in Pioneer Cemetery. We will post more information on this workshop as it becomes available. 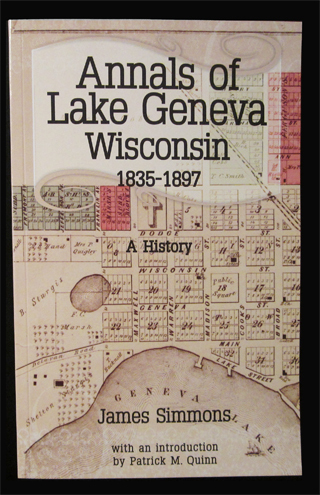 A classic historical resource of Lake Geneva, long out of print, has through the diligent efforts of Patrick and Mary Quinn and other helpful individuals been completely re-typed and re-published. James Simmons' "Annals of Lake Geneva Wisconsin", covering the years 1835 to 1897, is now available at the Geneva Lake Area Museum. If you have any interest at all in the history of Lake Geneva this is a must read! In 1996 Mary Tanner began her mission to rally the residents of oldest residential area of Lake Geneva to get a 15 block area designated as a historic district. It wasn't easy, but slowly interest grew and finally, with the help of the LG-HPC, we now have the Maple Park Historic District. To promote continued interest and to accommodate owners who are proud of their buildings history, an attractive plaque with the "date of birth" was designed. 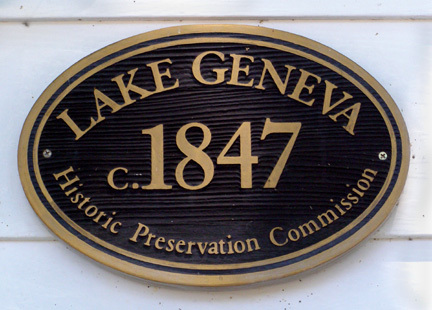 Currently over 120 plaques adorn historic homes and business buildings in Lake Geneva. might qualify, the LG-HPC will do the research; the owner pays for the plaque. Contact Mary Tanner at 262-248-0373. Federal 20% Historic Rehabilitation Credit. A 20% federal tax credit for rehabilitating a historic income-producing building. Wisconsin 5% Supplement Federal Rehab Credit. Also for income-producing buildings. Wisconsin 25% Historic Rehabilitation Credit. A Wisconsin income tax credit for rehabilitating a non-income-producing personal residence. Own a historic property. Properties must be listed in The National or State Register of Historic Places, or eligible for such listing or be a contributing property in a National or State Historic District. Spend a minimum amount of money on the rehabilitation work. For the personal residence that minimum is $10,000. Carry out the work according to program standards. Formally apply and obtain approval before beginning any work.